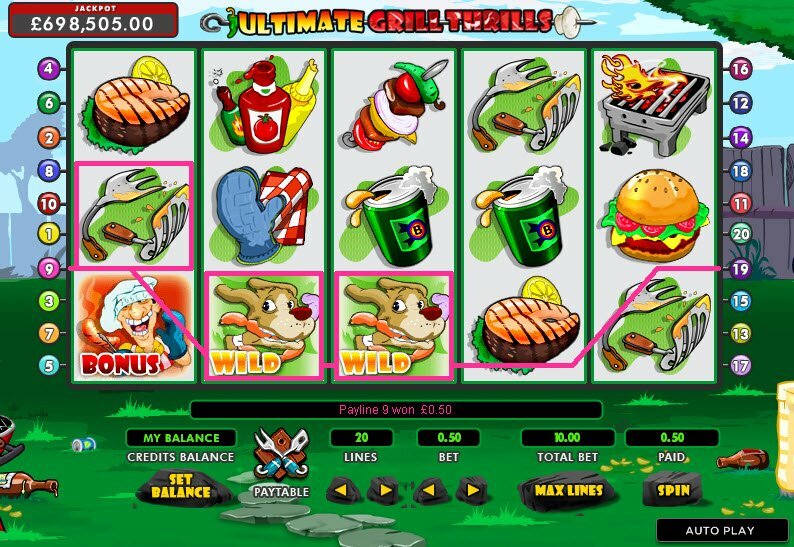 The Ultimate Grill Thrills slot combines food with money. A lot of money. The jackpot was unbelievably high when I was playing, and combined with all the delicious looking food on offer, I wasn’t about to desert this slot to go start grilling myself (not just because it always rains in London either!) A great way to spend some time. 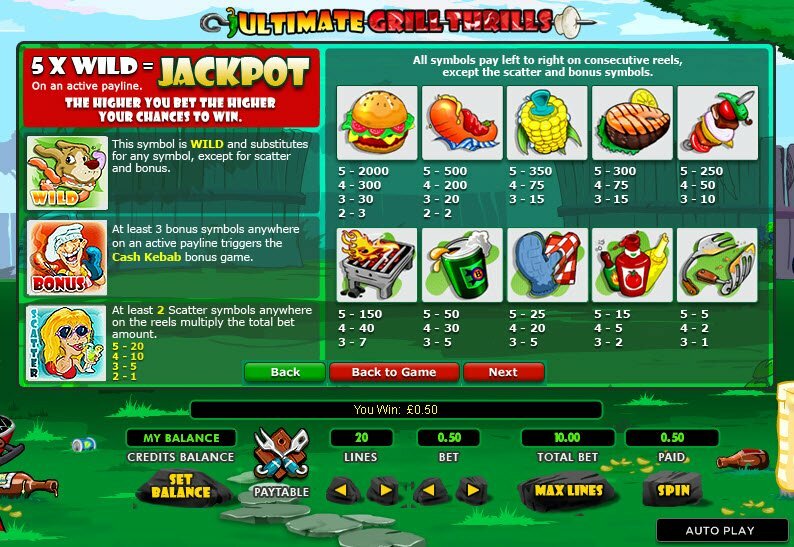 Here is a slot game to give you the ultimate thrills while you heat up and eat up your grills. The perfect accompaniment to a lazy Saturday afternoon outdoors fest for the family, Ultimate Grill Thrills slot will give you added thrills, if you still have room after all that grilled meat! With music that only plays when the slots reel around to reveal your winning lines, Ultimate Grill Thrill will keep you spinning to keep that music thrilling. There's a whole array of tasty treats in store on this 5-Reel, 20 payline Ultimate Grill Thrills slot game. A juicy cheeseburger is our most luxurious item on the menu, rolling in at 2000 coins. There's a hotdog, overflowing with mustard and ketchup and making me drool at 500 coins, and then there's the ever present corn on the cob, a steak and a shish kebab. The grill itself is one of our items, as is a can of pop. A bottle of ketchup along with some condiments and the cheapest symbol, the utensils used in the obligatory salad that no one eats, not with all that meat on offer. Our loveable family dog, in the process of escaping with a string of sausages in his mouth to wolf down is the Ultimate Grill Thrills slot wild symbol. He substitutes for anything except for the scatter and bonus symbols. Our lady of leisure, complete in red bikini sipping a cocktail with sunglasses in place is the scatter symbol and, 2 of her delectable mug on the reels will multiply the totally bet amount. The smiling chef happy with the foody heaven he is bringing to his family is the bonus symbol and will unlock the Ultimate Grill Thrills slot bonus game, Cash Kebab. You will get the chance to create your own concoction of meat and veggies on a skewer for cash prizes, the more bonus symbols you spin, the bigger the prizes! 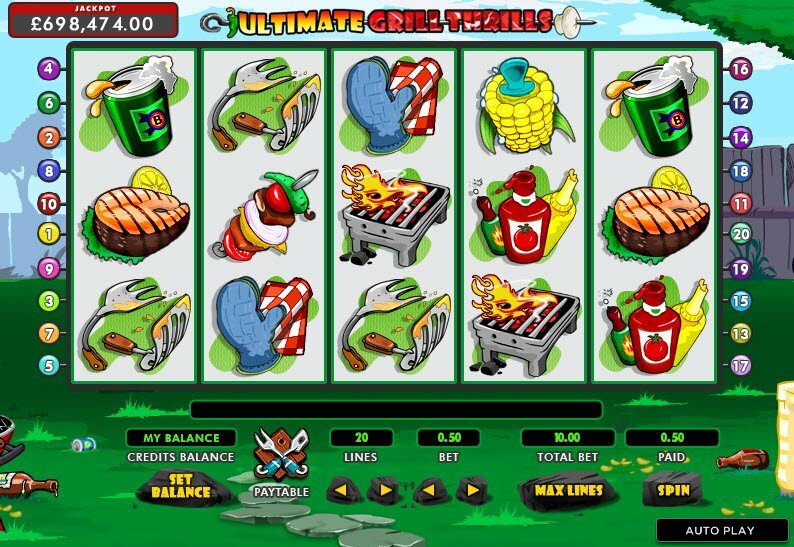 Then there is the growing Ultimate Grill Thrills slot jackpot, available to win at a spinning reel's notice, and currently standing at £699,756.961. Just think how much meat you could buy for your grill with that!